I finally plucked up the courage to use the beautiful, shiny overlocker that Ciaran bought me for my birthday back in July and guess what I made? Baby leggings! The overlocker situation is going to be a game changer for me I think – there’s something so satisfying about the way it chomps through the layers of fabric with ease and leaves you with a beautifully finished, stretchy seam. I’m working up towards sewing with some precious silks currently in my stash so thought I would make a few pairs of leggings for Orla to get some practice in first. 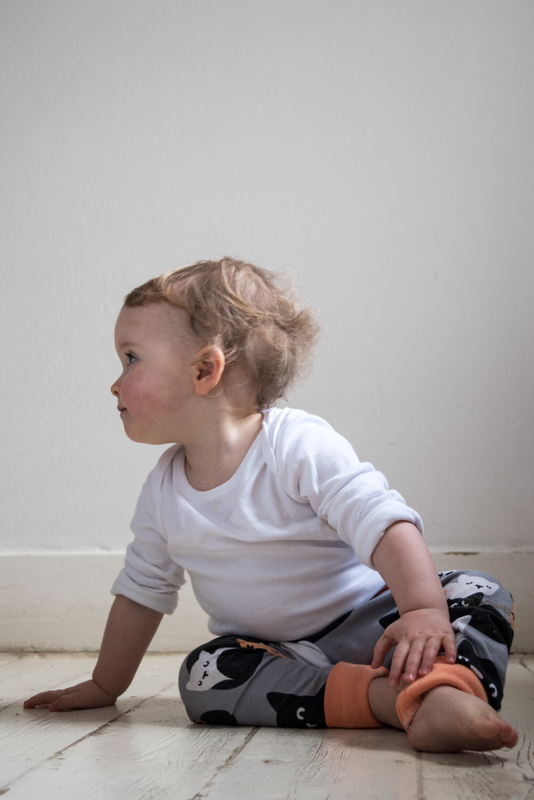 This amazing cat print jersey is by Finnish design studio Paapii Design which I ordered online from Bizzy and Boo Fabrics – they have loads of fun and colourful Nordic prints which are mostly made with organic cotton and ink. They also carry every shade of rib under the sun so it’s easy to find something to match! There are some amazingly talented crafty Mums on the internets at the moment, just casually making their own baby rompers, hoodies, leggings and vests like it aint no thing and I find it really inspiring. I’m looking forward to doing some selfish sewing next but will definitely show off some more of Orla’s new me made wardrobe soon!